Ergonomics Candy Bar and Wrapper - Work Safely! 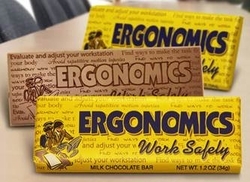 Our Ergonomics "Work Safely" Candy Bars say it all! This particular "Ergonomics" themed Candy Bar Wrapper is a Fully Wrapped Chocolate Bar all the way around! Perfect for hospitals, schools, rehab facilities, transportation companies, schools, and electric companies. Our Chocolate Wrappers are surrounded by delicious Belgian milk chocolate! The chocolate is imprinted and molded exactly the way you see it here, stating "Ergonomics" and we guarantee that the recipient will love it!